An intervention program aimed at helping obese women maintain their weight without adding pounds also significantly reduced depression in nearly half the participants, according to a new study from Duke University. The study was conducted with 185 low-income black women ages 25-44, each with a body mass index (BMI) of 25 to 35, who were receiving primary care at five community health centers in central North Carolina, USA. The program used software built by Duke researchers that personalized a weight-gain prevention intervention called the Shape Program for each of the 91 women in one of two groups. The intervention group tracked behavioral goals (i.e., no fast food) each week for 12 months via automated phone calls. Each participant also had monthly calls with a personal health coach and some took advantage of a YMCA membership. The other 94 participants were randomly placed in a control group that received usual care from their physicians. At the start of the 12-month study, 19 percent of intervention participants and 21 percent of usual-care women reported moderate to severe depression. But after 12 months, just 11 percent of intervention participants said they were still depressed, compared to 19 percent receiving usual care. At 18 months, 10 percent of the intervention group said they were depressed, while the usual-care group remained at 19 percent, according to the study. These findings were not related to how well the women did in the weight management program nor whether they were taking depression medication. "Interventions that focus on maintaining your weight, not just losing weight, may have more widespread effects," said lead author Dori Steinberg, a research scholar with the Duke Digital Health Science Center and the Duke Global Health Institute. "It is exciting that we improved depression among a population that is severely socioeconomically disadvantaged and has limited access to depression treatment. The reductions we saw in depression are comparable to what is seen with traditional approaches like counseling or medication treatment." The study, published online today in the American Journal of Public Health, cites past research showing that women are twice as likely as men to suffer from depression, and more than one in seven black women will suffer major depression. Compared with their white counterparts, black women with depression are less likely to receive treatment for it (39.7 percent vs. 54 percent), the study said. And among those who seek treatment, blacks are less likely than whites to receive care that corresponds to clinical practice guidelines, Steinberg noted. Moreover, depression is three times more common for those with incomes below the federal poverty level, according to the study. Obesity is also more severe among black women relative to other racial/ethnic groups, which can lead to a higher prevalence of obesity-related chronic diseases like diabetes and heart disease, the study said. Various studies have shown that black women find it more difficult to lose weight compared to other groups; it's unclear why that disparity exists, according to the study. Steinberg said the disparity might be partially influenced by differences in sociocultural norms related to weight, diet and physical activity or socioeconomic stressors and other barriers regarding access to treatment. "These higher occurrences may also have an impact on psychosocial outcomes such as depression," she said. "So interventions that focus on behavioral weight control may present a useful opportunity to address both obesity and depression." From 2009-2012, researchers conducted a randomized trial comparing a 12-month digital health weight-gain prevention intervention to usual primary care treatment at five community health centers in central North Carolina operated by Piedmont Health Inc. The Shape Program's "Maintain, Don't Gain" intervention did not focus on mood or depression. 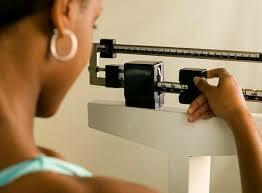 The study involved 185 black women ages 25-44, each with a body mass index (BMI) of 25 to 35. BMI is a measure of body fat based on height and weight. These women were at high risk for future health problems if they continued to gain weight. "Our goal was to prevent black women from getting into higher BMI ranges where the risk starts to increase dramatically," Steinberg said. For the 91 women randomly placed in the intervention group, the year-long program included five primary components: three personally tailored behavior change goals (i.e., no sugary drinks, walk 10,000 steps per day, no fast food), self-monitoring of these goals via weekly interactive voice response phone calls; tailored skills-training materials; 12 monthly individual counseling calls with a registered dietitian; and a 12-month YMCA membership. Along with weight-loss counseling from physicians, the 94 women in the usual-care group received semiannual newsletters that covered health topics other than weight, nutrition or physical activity, and the National Heart, Lung and Blood Institute’s “Aim for a Healthy Weight” brochure at the baseline visit." These results suggest that the 'maintain, don't gain' approach could be a first line of treatment for women who have barriers accessing traditional treatment approaches," Steinberg said. "A key challenge is getting health systems to use interventions like these, so we are evaluating the use of smartphone apps and text-messaging to make it easier for people to access them." This trial was funded by grant No. R01DK078798 from the National Institute for Diabetes and Digestive and Kidney Diseases.